As in my latest transitional shoe...get it? Sorry, but I just couldn't resist the play on words in the title there! 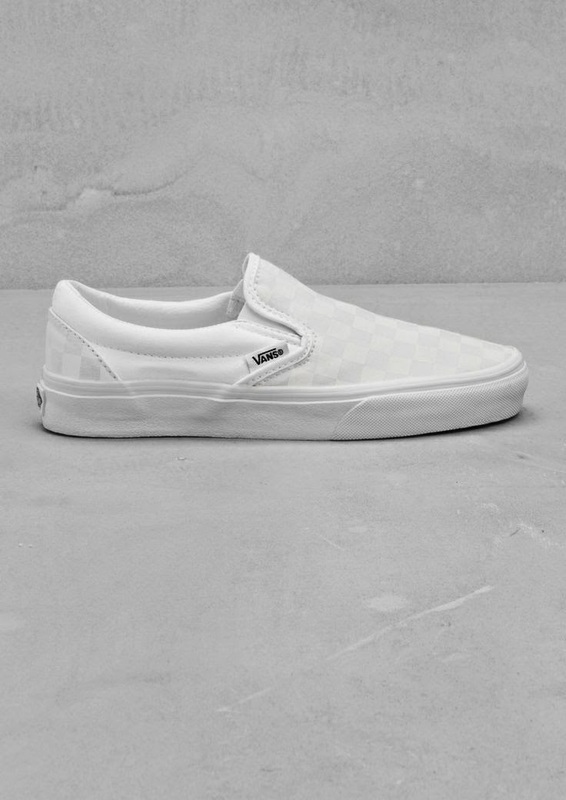 A few weeks back whilst Kurt Geiger had their 25% off, I was trawling their website for an alternative to my trusty Laurel's when I came across this pair of white Vans. Now, I loved the look of these straightaway as they are so similar in shape to my original purchase of the KG skate shoes. Anyway they didn't have them in my size and then I got sidetracked and forgot about them again until the beginning of this week when it suddenly occurred to me that I keep slipping into the Laurel's as they are so easy! Perfect for shoving on for the school run! So off I went surfing again and managed to find them on eBay via the Office outlet for just £26.99 inc P&P, so I ordered them on Tuesday and they arrived on Thursday! They are just what I was looking for, brilliant for this tricky transitional weather! However when I went to research them again for blog purposes, I started off on the Office website because usually things are the same price as the outlet but they were £46.99, so I checked them on eBay and they are now also £46.99. I would have to draw the conclusion that I just got incredibly lucky on Tuesday! However, not wishing to disappoint anyone, if you are in the market for some new skaters and like the look of the Vans, Surfdome have 20% off with the code ILOVESPRING* and their RRP is £44.99. Here's a snap of the first time I wore them. A shot with my Topshop duster coat over the top of the above outfit. And outfits from the rest of the week. Are you a fan of the good old skate shoe .....or have you found some other transitional footwear gem's that will tide you over until it's safe to get the sandals out? Next time I will be sharing a few bits that I have been buying and stashing for my holidays! I can't believe you nabbed such a bargain and they update everything mind you are always on trend so that kind of goes without saying. If they are as comfortable as the Laurels I would have them glued to my feet. I do believe you must have some kind of inbuilt bargain radar, Michelle - I wish some of your luck would rub off on me! I look ridiculous in skate shoes, so I will just have to admire yours, although the way the wind is blowing round here right now, I'll be wearing wellies if I dare to venture out at all!! Love the play on words Michelle & how lucky were you with your buy - fantastic & they look fab on you. I'm loving my two pairs of trainers & leopard print slip ons at the moment. Thank you Karianne, I think I could also do with a silver skate shoe as well! Amazing bargain! Are they canvas? I worry about white/canvas and me being a clumsy messy oaf!